Get Upcoming events and News in your box. Officer Amy Cassidy & Vice President C.P.A.A.A. Lewis Elrod at a Fingerprinting event @ Kroger's on South Tennessee Blvd. July 31, 2004. There were 39 children that participated in the event. This is a very good service provided by the Murfreesboro Police Department. Participants include Alumni of the Citizens Police Academy. The fingerprint cards are released to the parent or guardian and all information with a recent photo and D.N.A of the child are put into the Parents personal files. This card is used only in an emergency if the child is lost or missing. The tools required are few. Ink pad, FBI fingerprint cards, Jr. stick on police badges. No convictions for DUI, possession or sale of any controlled substance, or any offense involving moral turpitude. Attend at least 80% of classes. Others, come join us and get involved. These are released to the Parents for safe keeping. December 11, 2004 marks the first Shop With A Cop Program at Kmart here in Murfreesboro. An effort between Kmart, Murfreesboro Police Department, Citizens Police Academy Alumni Association (C.P.A.A.A. ), Murfreesboro City Schools. A great big YEHAAAAAAAW!!! to all those who participated and helped to make this a great event for these future leaders (the kids) of our Community. The kids seemed to have a great time. They were treated to breakfast, a visit with Santa Claus plus a small gift donated by Kmart, followed by a shopping trip where each child was given $20.00 by the C.P.A.A.A.. They were escorted by a Murfreesboro City Police Officer that donated their time to share with these children. The event was an exceptional treat for all involved. Thanks again to all. You know who you are. Major Adkinson & Mayor Bragg enjoying the action. Okay I'll cover Isle #1, you get #2. Yes Sir, What if he goes this way? Thank You M'boro Police for your protection. Hard at work making Thank You Cards. Your Community Your responsibility. What a Crew! Are you sure we havent been down this isle? Okay if I was you!! Come back here, slow down! Are you shure thats what you want? Honest it dosen't hurt when I Shop! Yes this is what you want. Kmart also gave a 10% discount for all items purchased. 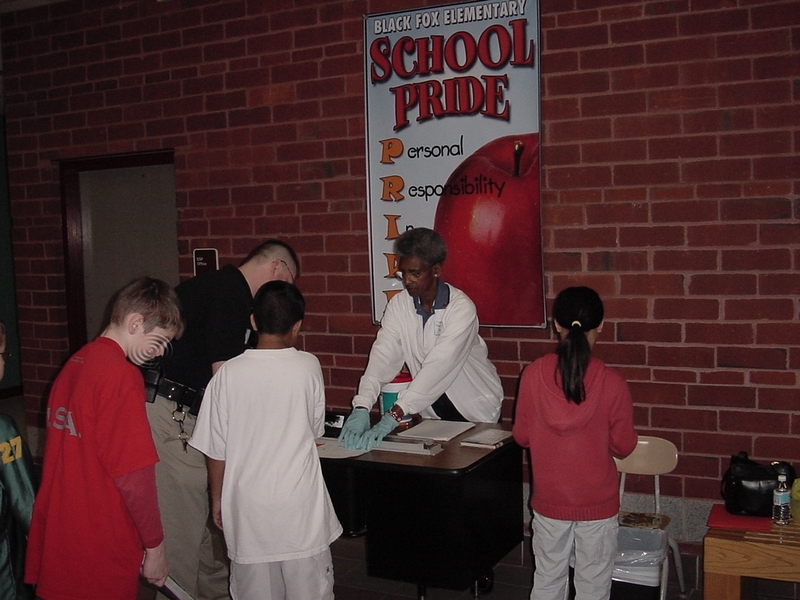 Approximately 400 students were fingerprinted. As always there are no records kept by the school system, Police Department or C.P.A.A.A. The parents were sent a card notifying them of the C.P.A.A.A providing this free fingerprinting for their children. They signed the cards allowing their child to participate if they so desired. The Teachers are sending the Fingerprint Cards home where the Parents will add a lock of hair and a current photo to the cards. They will then be kept in a safe place for the family in case of an emergency. The staff and children were all very pleasant to work with. There was only one young man that said that I was hurting his fingers. It seemed to work so smoothly. The Staff had it coordinated so well it was just a breeze. They even fed the C.P.A.A.A members. Lewis Elrod & Judy Merrill finishing up a class ready for the next any minute. Florence Smith & Don Richardson hard at work. Bob Cole completeing yet another. The gloves help when you fingerprint several children. That ink can get everywhere. Jo Adkinson helps to remove that ink that seems to jump from place to place. A pause in the action. Louis & Judy get a break between classes. Major Clyde Adkinson made an appearance and we put him right to work. The index finger is one of the easier ones to roll a print. Some fingers work seem to bend better than others. Just getting started 7:30 a.m.
C.P.A.A.A. member ready for action. Santa's Goodies waiting for the rush. Mayor Bragg kicking off the event. Lining up to go shopping. Chief Chrisman making a presentation of a quilt made by a C.P.A.A.A. member to be donated to a Police Officer. The quilt is to be relayed to the family of a recent Fallen Officer. On the job training, Major Adkinson is being trained how little ole ladies handle criminals when there is no Police in the time of need. Sergeant Cunningham has a Merry Christmas Laugh. It's your turn to push the buggy. Please! Santa presents gifts to the children compliments of Kmart. We never really grow up, you can see the M.P.D. Officers are full of life and fun. Please Santa all I want is a 2006 750il Bmw. The twelve cylinder you know the one. I've been good all year. Really! I told you guys I would never ask you to do anything that I wasn't willing to do myself. Kmart was a very gracious host as they gave a 10% discount in the checkout line for all the participants. Everyone had a good time this year and look forward to this annual event. A Great Big Thank You to Kmart, Murfreesboro Police Department, all Anonymous donations, all participants.